Ryan on the sound and light therapy table pre-float. 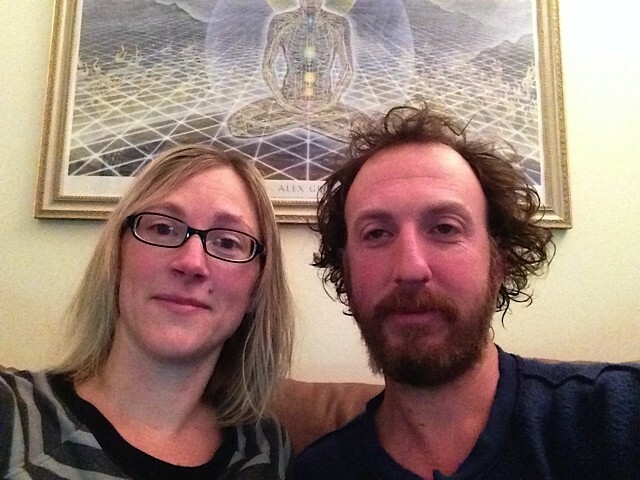 Several years ago, while my husband, Ryan, and I were still living in New York City, we heard about the therapeutic practice of floating. You float in about 10 inches of the saltiest water you can imagine, in a dark, quiet, enclosed tank. One hour in a float tank, we heard, could be as beneficial as five hours of sleep. We both wanted to try it, and even bought a gift card for a friend, but never dove in ourselves. So when I got a Localvore Today email this past summer offering a two-for-one float at a spa in Shelburne, I knew what had to be done. At first blush, floating naked in an isolation tank may not sound like a “date,” per se. But herein lies the beauty: Yes, you are alone in the tank, but you’re both alone in a tank and experiencing something totally unusual at the same time. And you’ll finish at the same time, and talk about what just happened for hours and days to come. One of the things we’ve struggled with since becoming parents — something I imagine many of us face — is the lack of true alone time. If I’m not caring for our kids, then I often feel like I should be hanging out with my husband or my friends or doing the laundry (it’s always the laundry). Even the most extroverted among us (see: my husband) requires some time without other people around, free from the pressure to be social. A float date is the best of both worlds. Together, you make the decision to embark on this unique journey. You arrive together and you leave together, but in between you are completely alone — off in another world where only you are allowed. Are you feeling me yet? This is a perfect date! 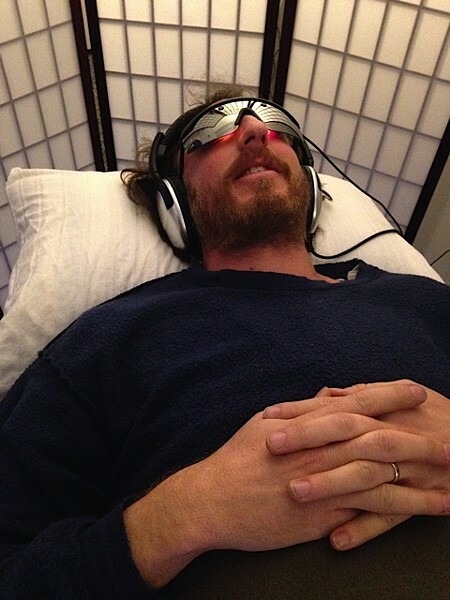 Before starting the actual float, Ryan and I opted for the Mind Spa — a sound-and-light therapy experience. For this portion of the date, we were actually side by side on two vibrating massage tables. We donned headphones and special glasses emitting pulsating light in changing hues. I lasted approximately two seconds with the glasses. 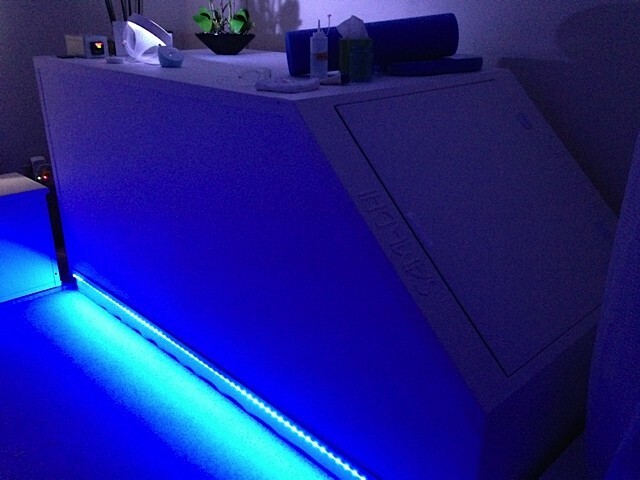 Ryan stuck it out and said the light therapy was one of his favorite parts of the entire spa visit. During this portion of the experience, my brain went from mile-a-minute non sequiturs to a clear and compelling narrative vision quest as I lay there with relaxing music and soothing vibrations working me over. After what felt like seven minutes, but was actually half an hour, I was primed for the main event. Angela and Ryan, post float. I took the required pre-float shower then stared into the tank, a large metal box dimly lit by a small underwater light. Feeling a combination of wonder and anxiety, I placed a pair of waxy earplugs into my ears, grabbed a foam bolster and neck flotation support and entered the void. With minimal internal debate, I closed the door behind me. I won’t go into detail about what I experienced inside the float tank because that would be a lot like telling you about the dream I had the other night. It’s not nearly as interesting or complex when recounted. Still, when Ryan and I rejoined one another in the waiting area at the spa, we couldn’t stop talking about the experience, amid proclamations of “wow” and “That was crazy!” We bonded over this shared new experience and promised we’d support each other in an effort to do it again. Which, not for nothing, is the point of marriage! Why do we commit ourselves to one person for the rest of our life if not because we believe that particular person will help us live a fuller, more interesting life? That life is made up of countless tiny experiences and a handful of life-changers that we go through together, inextricably tying us to one another and ideally making us a more perfect fit. This simple float date is now stitched into the fabric of us, and we are a more interesting “us” because of it. Satori Float Spa is located at 145 Pine Haven Shores Road in Shelburne. A 30-minute Mind Spa and 60-minute float session costs $60 per person. Visit the spa's website for details and lots of useful information.